Deciding on the most important piece of jewelry you will ever wear is no easy task. Luckily, you don’t have to settle in terms of color or style anymore. Our satin-finished titanium wedding ring with two gold-plated bands strikes a perfect balance between contemporary and traditional styles. Plus, you can enjoy the best of both silver and gold tones. This wedding band is ideal for any man who likes variety and versatility. Two gold-plated bands encircle this unique band to provide a tiered effect. The satin finish makes this ring soft to the touch, like a finely polished ring, but without the glare and sheen of a high polish. The 8mm satin-finished titanium wedding ring with two gold-plated bands comes in a wide variety of sizes, so you’re guaranteed to find the perfect fit. 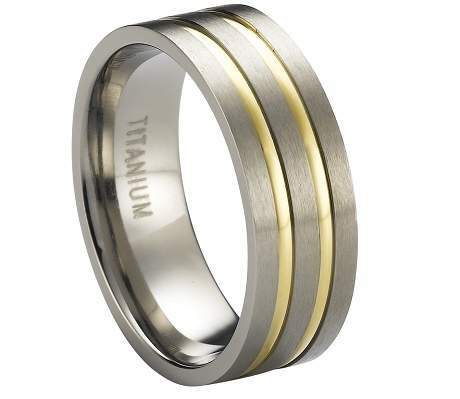 Our customers love the satin-finished titanium wedding ring with two gold-plated bands, because it is biocompatible and hypoallergenic, making it safe to wear if you have skin sensitivities. Furthermore, titanium boasts the highest strength-to-weight ratio of any transition metal. 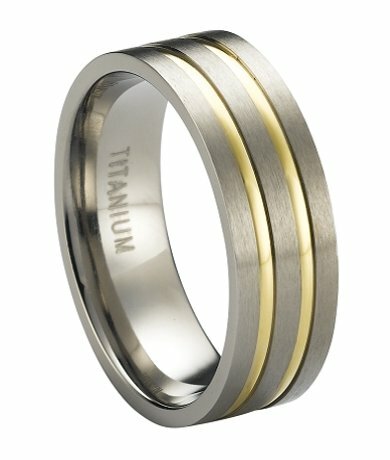 Our 8mm satin-finished titanium wedding ring with two gold-plated bands will never corrode, dent, or discolor over time. We designed this ring with a traditional fit. We recommend that you have your ring finger sized for accuracy by a professional jeweler, so you can determine whether a traditional ring is right for you and your lifestyle. If you have any questions, please contact JustMensRings.com for more information. Very cool ring. Looks better in real life than in the picture. Great value.